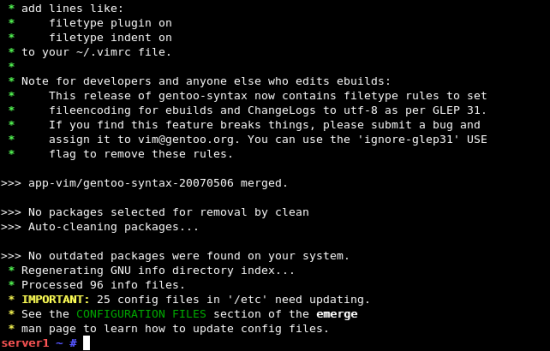 Welcome back to those who followed the Gentoo Handbook to install the base system. Add correct host key in /home/rachel/.ssh/known_hosts to get rid of this message. Now we're logged in as root on our new basic Gentoo system. It should be returning your fully-qualified domain name, eg, server1.example.com. By its nature, Gentoo takes a relatively long time to install new software, compared to binary distributions. This can be frustrating when following a howto like this, as you find yourself entering a few commands and then having to twiddle your thumbs while something and its dependencies build from scratch; repeat ad nauseum. You've already had to do it if you've followed these instructions for the base install. For this reason I've collected together the commands to do the initial software build here of everything used in the Perfect Setup configuration, so you can do all that in one go. Unlike some distributions, Gentoo does not automatically start new services, or install them in runlevels, or do any post-configuration that needs user input, so we can set it off building all the software and then come back later and do the configuration on them. If you want to do it this way, just enter the script below now. (You can just copy and paste it to your bash commandline). Then, as you're going through the rest of the howto, skip the commands that are given in bold. And paste this in if you need to run some X applications remotely (eg: VMWare Tools vmware-toolbox dialogue, and fetchmailconf). Update portage now, as the new version of portage is the one that supports the behaviour we're exploiting. In fact, even if you skip this step, it will do it right later when we do the full update, as it will install portage first, then stop and restart itself with the new version. But you won't get an accurate list of what's going to happen if you use --ask as the later example does. So this step is really for the avoidance of confusion. 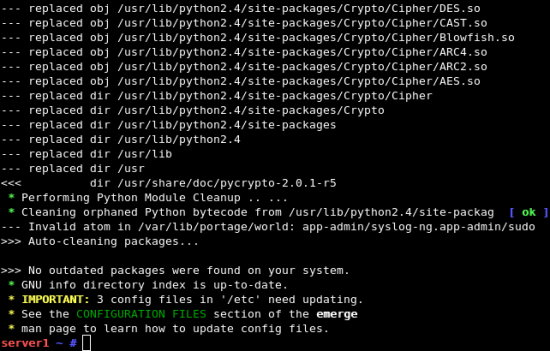 Afterwards it will warn you that some configuration files have been changed, and invite you to approve those changes. As all we've done here is to update portage itself, you should be able to just accept all the changes by selecting u for each file it offers you. We did an emerge --sync during installation, so we probably don't need to do another one right away, so let's go immediately to the update. We want to set some global USE flags. For the most part I've tried to avoid this in favour of package-specific flags, but we do need a few global ones. Or it makes things simpler anyway. Remember, if you carried out the optional step 4.2 above, you don't need to enter the commands that follow that are shown in boldface. Just take them as explanatory. And now we can actually perform the update. When you press Return (or type Yes) it will bring your system up to date. This will probably take some time. If you followed step 4.2, to set up the complete Perfect Setup software build in advance, all the Perfect Setup software and its dependencies will now be downloaded, compiled and installed as well as the due updates to the basic system; somewhere between 150 and 190 packages in total will be either built afresh or rebuilt. Portage will complain that you changed its world file manually, but it will get on and make the system the way the world file specifies; ie: installing the new software. Go out for dinner or catch a movie; or go to bed. This is going to take a while. This is to take account of any environment changes. Among these is almost certainly a gcc upgrade. For the rest of you, see you after the reboot. To install VMWare Tools in Gentoo, you now need to recompile the kernel (as the VMWare Tools installer will complain if the current kernel was built on an earlier version of gcc than the system now has, and gcc has just been upgraded). The genkernel options will ensure that everything is recompiled, but the previous kernel configuration is retained, in case you've made any other changes earlier. In the latter case, when asked, your init scripts are in /etc/init.d and your rc0.d to rc6.d directories are also in /etc/init.d. The VMWare Tools installer will detect and offer these as the defaults. The rcn.d directories won't do anything, they're just there because the VMWare installer wants them. You can remove them afterwards. Select Install VMWare Tools in VMWare itself. And follow the prompts. It's known that at present, the vmhgfs and the vmxnet modules won't build, but everything else should be fine. And set it to come up automatically on the next reboot. Find the line containing "X11Forwarding" and ensure that it is uncommented and set to "yes". And install the minimal X11 dependencies needed. Log in with X11 forwarding from your remote machine, and run it, and set what you need to set. There really is no other way to do needful things like synchronise to the host's RTC (very necessary on VMWare Server especially on AMD hosts) and to allow things like snapshots. You may want to reboot to make sure it all works. There's no harm beyond the time it takes in doing that when it's not necessary. It'll just think for a while and tell you there's nothing that needs reinstalling. It's sensible to do this about once a week, then changes come incrementally and bite-sized and are usually complete in a few minutes. Conversely, doing a long-overdue upgrade on a Gentoo system can be very painful. We've just done the equivalent of this above, in bringing the machine up to date from the most recent stage3 release, which as of first writing was some time ago. And this was from a brand-new, empty system. Imagine it when you have a number of services and users running.